You've read our review, seen whether iTunes or Zune was right for you, seen other reviewer's takes on it, and even learned everything you need to know about the Zune in our Q&A. 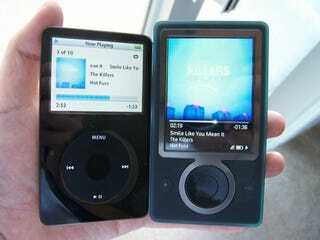 Now it comes down to the final question: should you buy the iPod or the Zune? After 72 hours of deliberating, I'll tell you what I would do. Since I've got an iPod, I'm sticking with the iPod. I don't want to have to buy all my music again, give up smart playlists, and basically learn to use both a new player and the corresponding software. Then there are all the accessories I don't want to purchase again. Plus, since there's no OS X support, Mac users have their choice made up for them. And I'm a Mac user when I can be. You really like the music/picture sharing: Zune. It's a feature not found on the iPod, but will have limited use unless your friends all buy Zunes. Chicken & Egg problem, where you don't want to buy one until other people have it, which means it'll take a while to get up to speed. You want a bigger screen: Zune. You need an all-you-can-eat subscription service: Zune. You want a store with a larger music library: iPod. You want a movie and TV store: iPod. You want contacts, calendar, notes, stopwatch, and iPod Games: iPod. You want to be different/want something new: Zune. Xbox 360 owners who purchase music and want streaming: Zune. Xbox 360 owners who purchase music and don't want streaming: iPod. You want a scratch resistant player: Zune. You want a built-in FM tuner: Zune. You want a touch-sensitive scroll wheel: iPod. For most people, we're going to recommend you get an iPod. It's got more support, plus it's backed by iTunes, which works well and gives you a lot more choice in music, TV, and movie purchases. Of course if you want a subscription service, or a bigger screen, or a built-in FM tuner, then there's the Zune. But if you're borderline between the Zune and the iPod, we'd play it safe and get the iPod, then wait for the 2nd generation Zune and see what's going on.